What's this? Somehow, the natural order of things in the automotive world has been upset to the point that Ford (129,898 total units) has outsold Toyota (126,540 total units) in the United States in the month of April. For those keeping track of such things, this is the first time in over a year that the Blue Oval (consisting of Ford, Lincoln and Mercury, but not including Volvo) has moved more machines than the mighty Toyota. Normally, posting a 31% decline in sales compared to the same month a year earlier wouldn't be cause for celebration, but that drop is actually considerably smaller than at rival automakers, including Toyota, which saw sales fall by an almost unbelievable 42%. Not a single Toyota nameplate posted sales gains in April of '09. Ford, on the other hand, found something to hang its hat on with the new 2010 Fusion. Ford moved 18,321 Fusions in April, which is a 21.7% improvement over last April and a record for any month. That success was offset somewhat by the 35.8% decline in F-Series truck sales, but a gain is a gain, and Ford will take anything it can get. 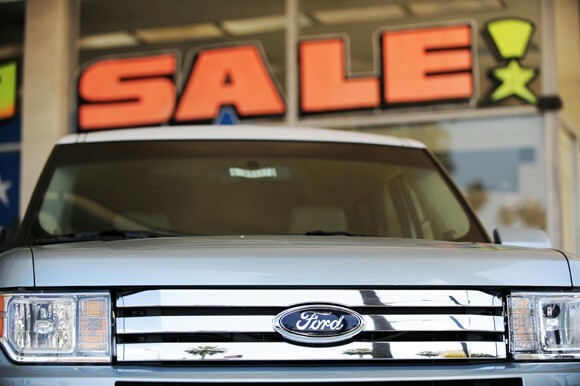 DEARBORN, Mich., May 1, 2009 – New, fuel-efficient products and quality on par with the best in the industry helped Ford increase retail market share in April – the sixth time in the last seven months that Ford's share of the retail market was higher than a year ago. In April, the Ford Fusion paced the share performance. Fusion sales totaled 18,321, a record for any month. April was the first full month of sales for the redesigned 2010 model and the new Fusion Hybrid version, and April is believed to be the first month that Fusion was among the top three-selling mid-size sedans. Recent independent studies rate Fusion and the Mercury Milan – the most fuel-efficient mid-size sedans in America – as having the best predicted reliability among all mid-size sedans. "We continue to operate in a very challenging economic and competitive environment," said Ken Czubay, Ford vice president, Sales and Marketing. "Especially given this external environment, we're very encouraged by the consumer response to our new mid-size sedans." "Sales of the 2010 Ford Fusion, Mercury Milan, Lincoln MKZ and hybrid versions exceeded our plan and customers also are equipping our new products with levels of content and features that are higher than we expected," he added. "This suggests consumers view our high-quality, fuel-efficient new products as offering outstanding value." The new Fusion Hybrid is one of four hybrid models offered by Ford. Hybrid models also are offered in the Mercury Milan mid-size sedan and the Ford Escape and Mercury Mariner small utility vehicles. All Ford hybrid models are the most fuel-efficient vehicles in their class, and the Ford Escape and Ford Fusion recently were named to Kelley Blue Book's list of Top 10 Green Cars. In April, combined sales of all hybrid models totaled 2,299, up 21 percent versus a year ago. Other new Ford products contributed to the retail share performance, including the new F-150 pickup, America's best-selling vehicle, and Ford Flex, the distinctively styled crossover utility that had its best sales month ever (3,190). Growing awareness and consideration of Ford and its high-quality, fuel-efficient products are starting to take hold. Plus, through June 1, Ford is offering consumers additional reasons to "Drive one." The Ford Advantage Plan offers payment protection up to 12 months for up to $700 per month on any new Ford, Lincoln or Mercury vehicle if a customer loses his or her job. Plus, 0 percent financing from Ford Motor Credit is available on select vehicles. On Tuesday, April 28, Ford launched a community engagement phase of the Ford Advantage Plan. Through June 1, Ford will donate $20 to Susan G. Komen for the Cure for every test drive taken at a participating Ford, Lincoln and Mercury dealership to Komen – up to $1 million. That amount could grow even higher as more than a thousand dealers around the country are joining in to match the company's donation. During the past 15 years, Ford has contributed more than $100 million to the fight against breast cancer. Ford, Lincoln and Mercury sales totaled 129,898, down 31 percent compared with April 2008. Retail sales were down 32 percent compared with a year ago and fleet sales were down 30 percent. Note: The sales data included in this release and the accompanying tables are based largely on data reported by dealers representing their sales to retail and fleet customers. Toyota Division passenger cars recorded April sales of 70,662 units, down 41.6 percent from the same period last year. Camry and Camry Hybrid remained Toyota's volume leader in April, posting combined monthly sales of 25,324 units. Corolla recorded sales of 18,534 units. Yaris reported sales of 8,118 units for the month. The Prius mid-size gas-electric hybrid posted April sales of 8,385 units.